Finding Success while Dissertating – Kristen D. Burton, Ph.D. Writing a dissertation is a remarkably difficult process. I can only speak of my experience working in the humanities, but I have no doubt that the difference of discipline in no way diminishes the challenges posed by constructing and writing original research. Oddly enough, before I took my comprehensive exams, I wasn’t that worried about the dissertation. I wrote a thesis while completing my Master’s degree in history, and I wrote so many papers for classes throughout my graduate career, the dissertation didn’t seem so daunting. Once I became immersed in the process, however, I felt a sense of shock at just how different the experience was. 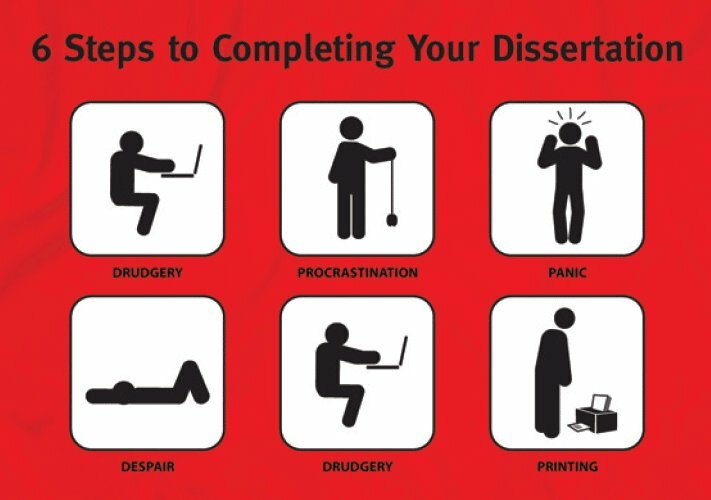 The dissertation stage is the point when many PhD candidates falter. The structure of coursework and exams vanishes. While you have an advisor and a committee to guide you and provide feedback through the process, you are responsible for the doing the research, and – most importantly – writing a cohesive manuscript that presents (and proves!) original research. That requires a great deal of self motivation, and finding that motivation is no easy feat. While I still have a way to go – editing and writing the conclusion – I have drafted the bulk of my dissertation, and my committee chair felt confident in my ability to defend in the fall. It feels a bit surreal, and also underwhelming. The grind of editing is nothing to shrug off, and the conclusion, while I do have much of the research compiled and a thesis in mind, still does not exist. I know that steady work, though, will see me through to the end. By December of 2015, I should have my degree in hand. Writing my dissertation has been an educational experience, to say the least. While the last thing the world needs is another blog post about writing a dissertation, I wanted to share some of the important lessons I learned throughout the process. 1.) Research takes a very long time. 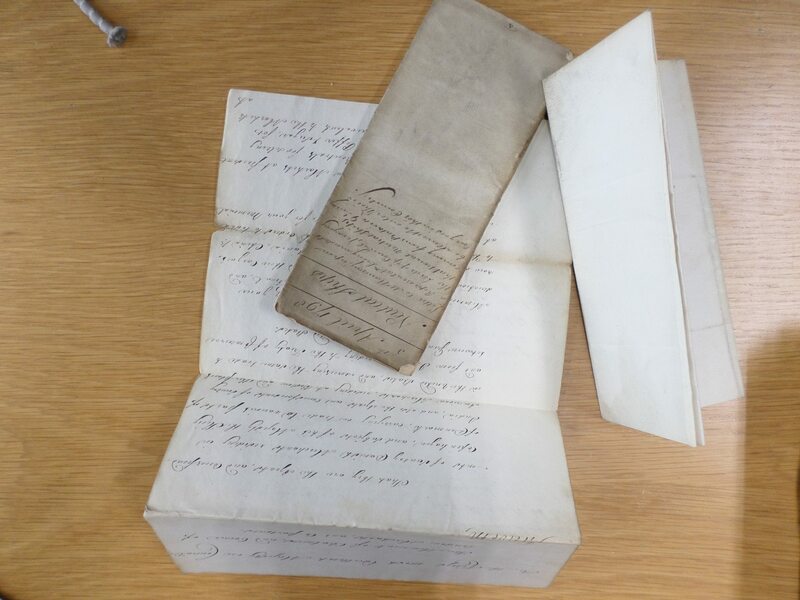 Researching at the National Archives UK. When I returned home, the real challenge began. I converted the pictures into PDFs to make reading the picture files easier (I still have only done this for a fraction of the collections I looked at, simply due to the insane amount of time this converting process took.) Then, I found myself staring at thousands of pictures. For weeks. Months. I stared at pictures – squinting, zooming – doing everything I could to decipher the words written in a letter five centuries ago. I took notes. So many notes. All of this was simply to see if any of the documents fit into the idea of what I imagined my dissertation would be about. Respect the research, but more importantly – respect the amount of time it requires. 2.) The project will change as you write. I wrote three chapters before the overarching narrative of my dissertation became clear. The idea of a dissertation prospectus (the lengthy written overview of the project) that departments often require is to help you go into the research and writing process with a clear idea of what you want to accomplish. There is value in writing a prospectus, but the project I wrote about in that document bears zero resemblance to the dissertation I produced. Many PhD students are familiar with this. They know going into the dissertation stage that the project will evolve, and it should evolve, based on the documents you use. Still, what I didn’t expect was how much the project would change when I was deep into the writing. The first few chapters were more like seminar papers, linked together by topic and timeframe, but the overarching connections were not clear. You don’t always know where the story will go until you write it. It wasn’t until I wrote the second-to-last body chapter that it started to make sense. This means I need to go back and revise the earlier chapters to fit the narrative, but at least I now have that sense of direction in mind. Don’t let the shifting nature of the project deter you, though. Writing without a sense of direction is challenging, but it can also reveal unexpected changes in the narrative. 3.) The information you gather doesn’t mean anything until you write about it. This was the best advice I received during the entire process. While I worked as a research fellow at the Fred W. Smith National Library for the Study of George Washington at Mount Vernon, Dr. Doug Bradburn, the Founding Director of the Library, often checked in on the fellows and offered his advice, especially to the fellows who were graduate students. During a conversation we had, Doug said, “You have all of this information in your head, but it is just mush – it doesn’t mean anything – until you write about it.” While slightly paraphrased, the meaning of this statement stuck with me. I struggled a lot with the ‘I have all of this stuff, what am I supposed to do with it?’ questions, but Doug’s advice helped me kick things into gear. Any time I became stuck or felt overwhelmed with the amount of work I had left to do, I recalled that advice, and I sat down to write. 4.) 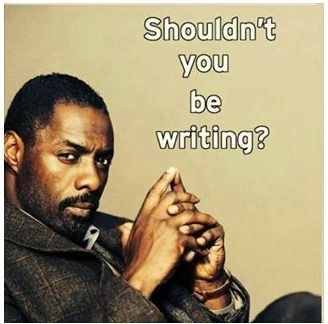 Shut up and write. This is a popular phrase used by writers. 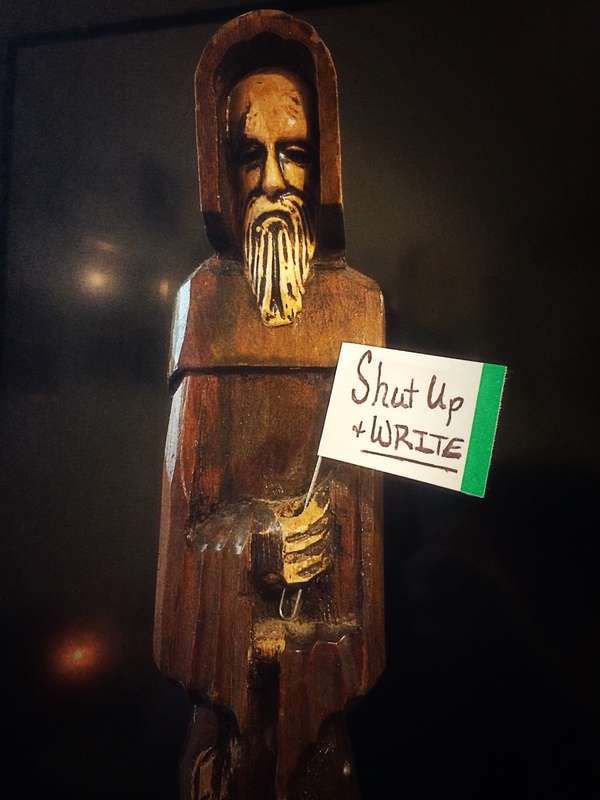 A quick Google search will bring up a litany of blog posts and other web pages that promote the mantra: “Shut up and write.” There is even a #shutupandwrite hashtag on Twitter. I made my own “motivational monk” who constantly looks down on my desk with these words displayed in his hand. Some have pushed back against this, viewing the phrase as a form of ‘shaming’ people into writing. Personally, I like it. It works for me. I combined that mantra with a daily word count goal popularized by L.D. Burnett’s “Grafton Line” challenge. The idea is to write every day with a word count goal in mind. I set mine at 500 words. 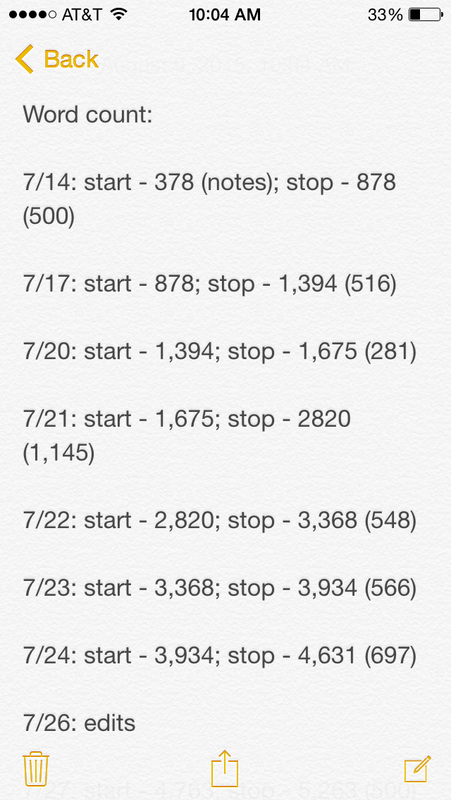 I figured that writing 500 words a day roughly translated into a chapter per month. Most days I met that goal, other days… well, I did what I could. There were writing days when things flowed so well, I embodied the song, “Walking on Sunshine.” Other days, it took everything I had just to reach 500 words. Those days felt like true battles. But I stuck to it, and the results were surprising. I kept track of my daily progress in the Notes app on my phone. This helped keep me accountable. At the start of the summer, my committee chair and I agreed to a plan: write two chapter drafts (the last two body chapters of my dissertation) before the start of the fall semester, and I could plan on defending before December. It felt daunting. I knew going into this plan that the last two chapters would be the most difficult. In the midst of those summer writing goal, I moved to a new city, I got married – you know, life kept happening. Still, every day, I sat down and I wrote. The first of the two chapter drafts went in July 3, and I submitted the second on August 14. The dissertation is a beast. While mine is not yet complete, I can see the finish line. There will be days when finishing it seems impossible. There will be days when you question your life choices. But there will also be days when you can look back through all of your drafts, see the massive amount of work you’ve done, and feel a sense of pride that you wrote that. A (re)turn to the humanities?